When SPB and Ilayaraja parted ways: Will they ever work again? In March 2017, when singer SPB was in the US as part of a global tour, he was shocked to receive a legal notice from his friend Ilayaraja for copyright violation, by singing his songs without consent. Ilayaraja’s lawyer said in the notice that Ilayaraja held the copyright of the songs composed by him. The spat between the two shook the music world as they were always considered close friends, a friendship that spanned over four decades. In an earlier article, inmathi.com had traced the early days of SPB and Ilayaraja, particularly the music director’s struggle to make ends meet in Chennai. The development came as a shook to common friends of SPB and Ilayaraja, and wondered what could have gone wrong, since they supported each other in the early formative years. SPB and Ilayaraja would call other in the singular form (‘vaadaa podaa’). Their kids spent a lot of time together, and even collaborated in areas like film production, making of music albums etc. SPB’s son Charan would engage Yuvan Shankar Raja as the music director of his productions, while Gangei Amaren’s son, Venkat Prabhu, was the director, assisted by his brother Premji Amaren. Vijay Yesudas, the singer son of K J Yesudas, and Yugindran, son of Malaysia Vasudevan, a common friend of Ilayaraja and SPB from their early days, would also be a part of the team that spent holidays together. Even GenNext had a strong bond. Thus, SPB was pained beyond words on receipt of the legal notice from Ilayaraja’s lawyer. Rather than bend, SPB preferred to take the high moral ground and announced in an FB post that he would stop singing songs composed by Ilayaraja in view of the notice. SPB also announced that he would perform songs of other music composers. After all, SPB said, he was fortunate enough to have sung for a large number of composers other than Ilayaraja. The notice said if SPB, his son SPB Charan and Chitra continued to sing IR songs, they would be breaking the copyright law and he and his team would have to pay huge financial penalties and face legal action. “Let me say, I am ignorant of these legalities. Charan designed this world tour and we kick started this ‘SPB50’ in August in Toronto (Canada) and then performed in Russia, Sri Lanka, Malaysia, Singapore, Dubai and did a lot of shows in India too,” he said. “I did not get any feelers from Raja’s office at that time. I do not know why now when we started US tour (a legal notice has been sent to him),” Balasubrahmanyam, fondly called ‘SPB’ by his fans, said. “As I said earlier, if it is a law, so be it and I obey it,” he said. Under the circumstances, SPB announced that “he and his troupe would not perform Ilayaraja’s music from today”. “But the show (music concert) should happen. By God’s grace, I have sung lots of other (music) composers’ songs too which we will present. Hope you will bless our concerts as usual,” he said. He requested the fans and audience not to have any “harsh” opinions and discussions regarding this on Facebook. “If this is the design of God, I obey it with reverence,” he remarked. This was not the first time that Ilayaraja was involved in a copyright claim battle. In 2015, the Madras High Court gave an injunction against four music labels from monetising the composer’s works. Stating that the earlier agreements signed with labels back in the day, Ilayaraja said that they were valid only for five years and that they had become void. “Only I hold the rights to all my songs. The money I would now get by selling the rights would be shared with the producer of the film, singers, and lyricists,” he said, after the injunction. Since the composer said he holds the absolute copyright to his works, he further warned that action would be taken against television channels and FM radio stations if they played his works without permission. 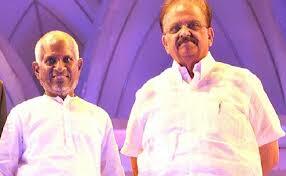 The fresh row between Ilayaraja and SPB became a subject of intense discussion in the social media. SPB fans questioned the rationale of IR, while the music director’s fans said he was merely following the Copyright Act, and that SPB tour organisers could easily pay a small amount as royalty while making huge profits during the tour. However, just a few weeks ago, SPB decided to sing a few Ilayaraja songs during his shows in India. Music industry sources said the organizers of his events in India were paying royalty to IPRS, a share of which would go to Ilayaraja as composer. This has come as a huge relief to fans in both camps, as the IR songs formed the core of SPB shows. As SPB himself said, “Ilayaraja was born for me, and I was born for Ilayaraja”. The compromise had been reached without any direct meeting between the two ‘friends’. Even prior to the legal notice, Ilayaraja had stopped using SPB for his film compositions. It’s a long time since SPB sang for IR. Will Balu once again sing with Ilayaraja as music director? In the next part of this series on Ilayaraja 75, we will discuss what Ilayaraja’s brother Gangei Amaran said after the legal notice to SPB. Forums › When SPB and Ilayaraja parted ways: Will they ever work again? This topic contains 0 replies, has 1 voice, and was last updated by Rangaraj 5 months ago.